Buyers Are Approaching Yahoo. Where Did It All Go Wrong for the Internet Giant? Yahoo is in the midst of courting acquisition offers in the hopes of saving the once-triumphant tech giant from slipping into obscurity. UK newspaper The Daily Mail, with its own sprawling online presence, is the latest suitor but it is far from being the first company to make an offer for Marissa Mayer’s struggling empire despite its well-documented troubles. So how exactly did a company that was once a darling in Silicon Valley find itself in this unenviable position of selling itself off? In January 2000, Yahoo was a mainstay of the internet. Its share price was trading at an all-time high of $118.75 per share. Six years since its launch, the company founded by Jerry Yang and David Filo in Stanford University was riding a wave of momentum that placed it front and center of the dot-com bubble and the blossoming internet generation. The duo set up the company in 1994 as a directory of websites with the not-so-catchy name of Jerry and David’s Guide to the World Wide Web. Eventually renamed Yahoo! (acronym for Yet Another Hierarchical Officious Oracle), it would reach one million hits by December that year and in March 1995 was officially incorporated. And the wins kept coming. It filed its IPO in 1996 and launched Yahoo UK that same year. Next came the acquisitions. It scooped up Four11 in 1997 and turned its email platform Rocketmail into Yahoo! Mail. ClassicGames.com was bought and rebranded Yahoo! Games. And in 1999, it acquired web host GeoCities. In June 2000, the company signed a deal with Google, which would allow Google’s search directory to partly power Yahoo’s. It seemed like Yahoo could do no wrong. But little did it know that what goes up must come down. The now-infamous dot-com bubble finally burst in 2000, sending Silicon Valley into a tailspin and start-ups that were considered tech sweethearts in the late ‘90s shut their doors. Yahoo survived but not without bruises and scars. In 2001, CEO Tim Koogle stepped down. He had served since 1995 and little did he know at the time that he would become probably Yahoo’s most stable CEO in its history. He was replaced by Terry Semel, who was perhaps unknowingly facing a storm of adversity ahead. By September 2001, Yahoo’s stocks were trading at an all-time low of $8.11, a stark contrast to dizzying highs just two years prior. Image courtesy of Daniel Zuchnik / Stringer via Getty Images. Down but not out, Yahoo dusted itself off and ventured into the 21st century with a fresh strategy. Between 2002 and 2005, it attempted to challenge AOL for internet services. The company signed partnerships with Verizon, BT Openworld, and SBC to provide branded dial-up and DSL services. At the same time, it was trying to reclaim a foothold in the search business by acquiring software companies and other search engines like AltaVista, Inktomi, and Konfabulator; and in 2004, it ended its Google deal in favor of holding more independence over its search services. From here, the rivalry between Google and Yahoo would get much more heated. In 2004, Google launched Gmail, which ultimately stole significant email market share away from Yahoo Mail. But Yahoo’s acquisition spree would continue with the buyout of Flickr in 2005 for reportedly $40 million. However, for every up there was a down. Six years in his role as CEO, Terry Semel stepped down in 2007 after unease from shareholders over how the company was performing. Soon the prodigal son would return. Co-founder Jerry Yang took over as CEO later in the year and would oversee Yahoo as it faced a takeover bid from Microsoft in 2008 for a whopping $44.6 billion. It was a bid that eventually fell through and by 2009, Yang was gone as CEO. He was placed by Carol Bartz, another short-lived CEO that was fired by chairman Roy Bostock in 2011 for underperforming. This would continue a vicious cycle of instability for Yahoo at the top as it tried to figure out what exactly its place in the world was. In fact, in a 2009 interview Bartz told PC World that she was struggling with the “question of what Yahoo is.” Is it a search company? Advertising company? Content creator? This didn’t become any clearer in 2012 with former PayPal president Scott Thompson at the helm. During the early part of that year, the company shed thousands of employees in cost cutting measures, and executives such as chief product officer Blake Irving and one of its advertising heads Andrei Broder, all left the company. To top things off, Thompson would soon resign as CEO following a controversy over the accuracy of his resume and qualifications. Stability for Yahoo was nowhere to be found. By this stage-mid-2012-Facebook was an internet behemoth and Google was no longer Yahoo’s sole competition concern. Marissa Mayer, former Vice President of Google Product Search, was appointed CEO in July 2012 and has faced many hurdles over the years in trying to steer the ship on course. Despite her best efforts, she has been unable to right the wrongs of the last 15 years or so. One of the most notable moves Mayer oversaw was the $1.1 billion acquisition of Tumblr in 2013 as well as the relaunch of Flickr. In 2014, Yahoo continued its acquisition trend by buying social diary Wander and Distill, a recruitment tech start-up. It also refocused on content with the launch of Yahoo Tech with former New York Times tech columnist David Pogue and hiring anchor Katie Couric to lead its news sites. However Yahoo has not been able to revive itself in any significant way even with some favorable assets. The company still owns a 384 million-share stake in Chinese internet and e-commerce giant Alibaba, something that has generated money for the company, but in December Mayer dropped plans to spin-off its shares as its own company over tax concerns. This led to more questions over the future of Yahoo and Mayer. Yahoo is still a company with value though. ComScore figures show that while it doesn’t command the same traffic as Google and Facebook, Yahoo’s websites still have high visitor numbers (beating out Amazon in February) and platforms like Flickr and Tumblr are very popular with strong user bases. 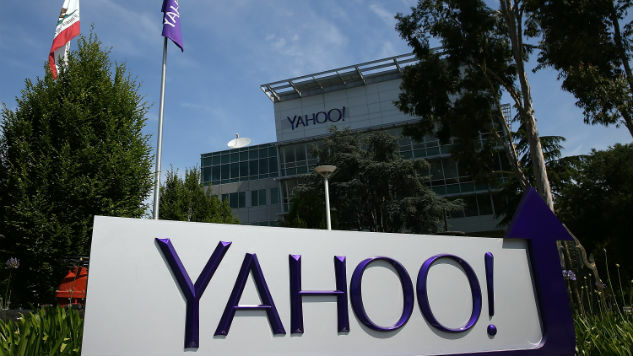 There’s a hitch though, ReCode reported earlier this month on “the book”, a document that has been handed out to prospective buyers that shows Yahoo’s revenues will drop some 15% this year. Essentially, its ad business is dropping in value because its ads are not as targeted and precise compared to Facebook and Google. This is mostly down to “unknown” users—people that are visiting their sites but not logging in. So why would anyone want to buy Yahoo at this stage of the game? The Daily Mail confirmed last week that it is in discussions to buy the company most likely to expand its ever growing online presence in the US. There are reportedly five potential buyers at this point. One is rumored to be Verizon, which already owns Huffington Post, TechCrunch, and Engadget. Acquiring Yahoo would give it more content, more advertising possibilities, and access to more users. Another thing to consider is Yahoo’s intellectual property, with The New York Post_ reporting that its patents are worth somewhere in the region of $4 billion—an attractive proposition. These patents include technology in the fields of advertising, mobile messaging, and data mining, and these are just the patents that we’re aware of. Analysts have also pointed out that Yahoo has an impressive real estate portfolio and owns a stake in Yahoo Japan, which has several investments (including Skyscanner and Signal) that could yield future profits. At this stage, who knows what the future holds for Yahoo and if it will ever reclaim the prominent position it once had. With its competitors, namely Google, being so far ahead at this point, could a fresh leader like The Daily Mail or Verizon be its savior? We’ll have to wait and see.